It is important that you are aware of the zone you are in while you are out on the water, so take time to check where you are going and what you can do there. Severe penalties apply for individuals breaching Great Barrier Reef Marine Park legislation. You should also familiarise yourself with the Special Management Area requirements. Please note: The activities that can be carried out within most State and Commonwealth Marine Park zones are generally the same, however there are some differences. Refer to the relevant zoning plans for further details. The Preservation (Pink) Zone is a 'no go' area. A person cannot enter a Preservation (Pink) Zone unless they have written permission and extractive activities are strictly prohibited. A permit is required to conduct research in this zone. Research may occur in a Preservation (Pink) Zone, if it cannot be undertaken elsewhere, but only if the research is relevant to, and a priority for, management. The Preservation (Pink) Zone makes up less than one per cent of the Great Barrier Reef Marine Park. The Marine National Park (Green) Zone is a 'no-take' area and extractive activities like fishing or collecting are not allowed without a permit. Anyone (with the exception of unattached dories*) can enter a Marine National Park (Green) Zone and participate in activities such as boating, swimming, snorkelling and sailing. 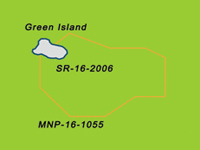 Travelling through a Marine National Park (Green) Zone with fish on board is also allowed (it is only an offence to fish in a Marine National Park (Green) Zone). Fishing gear, such as rods with attached hooks, must be stowed inboard the boat or in rod holders. All fishing apparatus must be out of the water. Anchoring is also allowed in a Marine National Park (Green) Zone, however in high use and sensitive areas, use of a mooring may be necessary or there may be a no anchoring area defined by buoys. Commercial fishing dories must be attached to a mother vessel at all times whilst in a Marine National Park (Green) Zone. The Marine National Park (Green) Zone makes up about 33 per cent of the Great Barrier Reef Marine Park. * 'Dories' are vessels used in association with a primary (mother) commercial fishing vessel that is either licensed, permitted, or used, to fish on a commercial basis under a Commonwealth, State or Territory law. Dories must be attached to a primary vessel at all times while in a Marine National Park(Green) Zone. The Scientific Research (Orange) Zone allows for research, in areas primarily around scientific research facilities that are relatively undisturbed by extractive activities. One type of Scientific Research (Orange) Zone allows public access and is shown as green with an orange outline on Zoning Maps (see Fig.1). For people who are not undertaking research, these areas are essentially the same as Marine National Park (Green) Zones, where only non-extractive activities like swimming, snorkelling and diving are allowed without written permission. The other type of Scientific Research (Orange) Zone is shown on the map as orange (see Fig. 2). These areas do not allow public access. There are two of these areas and they are located adjacent to the Australian Institute of Marine Science near Townsville and surrounding One Tree Island Research Station in the Capricorn Bunker Group, offshore from Gladstone. The Scientific Research (Orange) Zone makes up less than one per cent of the Marine Park. The Buffer (Olive Green) Zone provides for the protection and conservation of areas of the Marine Park in their natural state, while allowing the public to appreciate and enjoy the relatively undisturbed nature of the area. Trolling for pelagic fish species is allowed in the Buffer (Olive Green) Zone. However, all other forms of extractive activities such as bottom fishing and spearfishing are prohibited in this zone. Seasonal closures apply to some Buffer Zones. Pelagic species include species of trevally, scad, queenfish, rainbow runner, dolphinfish, black kingfish or cobia, barracuda, sailfish, marlin, swordfish, mackerel, tuna, bonito, wahoo, small toothed jobfish and green jobfish. The Buffer (Olive Green) Zone makes up approximately three per cent of the Great Barrier Reef Marine Park. The Conservation Park (Yellow) Zone allows for increased protection and conservation of areas of the Marine Park, while providing opportunities for reasonable use and enjoyment including limited extractive use. Most extractive activities are allowed in a Conservation Park (Yellow) Zone with additional restrictions for most fishing activities. Limited collecting (includes oysters and bait, excludes take of coral, live or dead and anemones). Public Appreciation Special Management Area boundaries are shown as broken pink lines on the zoning maps. These Special Management Areas prohibit spearfishing, commercial harvest (dive-based) fishing, and aquaculture in some Yellow Zones. Read more about Special Management Areas. *Limited line fishing is allowed in the Conservation Park (Yellow) Zone. 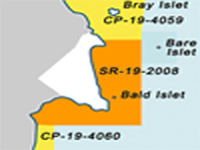 No more than one dory is to be detached from its primary commercial fishing vessel in the Conservation Park (Yellow) Zone and the Buffer (Olive Green) Zone. The Habitat Protection (Dark Blue) Zone provides for the conservation of areas of the Great Barrier Reef Marine Park by protecting and managing sensitive habitats and ensuring they are generally free from potentially damaging activities. Trawling is not permitted in the Habitat Protection (Dark Blue) Zone. The Habitat Protection (Dark Blue) Zone continues to provide for reasonable use of areas and makes up about 28 per cent of the Great Barrier Reef Marine Park. The objective of the General Use (Light Blue) Zone is to provide opportunities for reasonable use of the Great Barrier Reef Marine Park, while still allowing for the conservation of these areas. The Commonwealth Islands Zone is comprised of those land areas of the Great Barrier Reef Marine Park above the mean low water mark that are directly managed by the Commonwealth. Certain Commonwealth Islands are subject to private lease arrangements, Defence activities or are managed by a caretaker. These islands have additional management arrangements in place. Contact the Great Barrier Reef Marine Park Authority on freecall 1800 990 770 for more information. As with all islands in the Great Barrier Reef World Heritage Area, seasonal bird closures exist on some Commonwealth Islands. For further information contact the Great Barrier Reef Marine Park Authority. Eshelby Island located approximately 30 kilometres north of Airlie Beach is surrounded by a Preservation (Pink) Zone and therefore no access is permitted to the island other than in accordance with Preservation (Pink) Zone requirements. Camping permits for Russell Island and Kent Island can be obtained by contacting the Department of Environment and Resource Management in Cairns on (07) 4046 6677. Traditional use of marine resources is allowed on Commonwealth Islands with written permission or in accordance with an accredited Traditional Use of Marine Resources Agreement. The Estuarine Conservation Zone provides for the protection of areas of Queensland's Great Barrier Reef Coast Marine Park in a natural state while allowing the public to appreciate and enjoy the relatively undisturbed nature of those areas; to maintain fisheries production and use; and to provide for traditional hunting and gathering. Contact the Department of National Parks, Recreation, Sport and Racing on 13 QGOV (13 74 68) for more information. In all zones where fishing is allowed, Queensland fisheries legislation applies. Visit Fisheries Queensland for more information.